Selling an old vehicle may be quite difficult, but it isn’t as hard as selling a car that is unregistered. 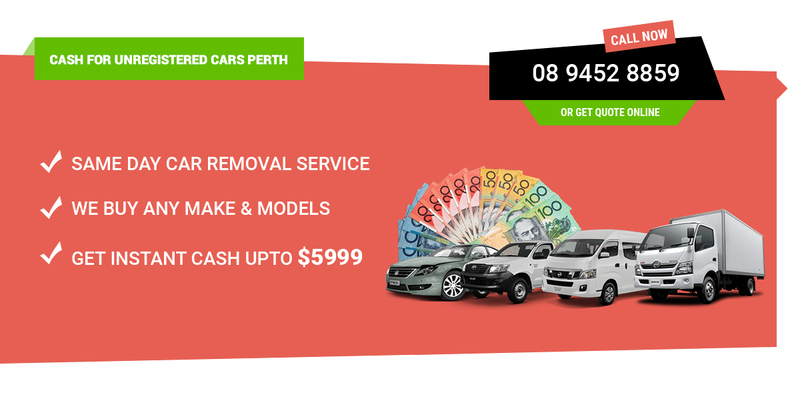 But if you live in Perth, you need to know that there is actually an easy way to sell an unregistered automobile & you can get top cash for unregistered cars. Some states have made it illegal to do this, but here in Perth it isn’t illegal, as long as we have a licence. When you drop us a line, you can put those concerns about selling your unregistered automobile to rest. Perhaps your car’s registration has simply expired. Or maybe it isn’t re-registered with a department that is authorised to do so. There are states in Australia where it is against the law to have a car on your property if it is unregistered. If you are in this situation, you may want to get rid of that car. And you can. By selling it to us here at “Perthautowreckers”. We buy vehicles in any condition, of any make or model, and whether they are registered or not! So, whether you own a van, Ute, SUV, 4×4, truck or car, if it is unregistered and you want to sell it, we are the ones to sell it to. We offer the best prices, the best deals, and you will be left a very satisfied customer. So, you have realised that you do, in fact have an unregistered car. The likelihood is that you will want to get rid of it. Or even sell it! If this is the position that you are in, here are two options that you have to choose from. One of them is this: You can get it registered. However, if the vehicle is in terrible condition, you have another choice: Sell it to a cash for car service who have a licence to buy unregistered vehicles. How to sell my unregistered car Perth? Get in touch with us – You can either fill out the quote request form on the main page of our website or call us. If you can just tell us the make, model, age and condition your vehicle is in, we can then respond quickly. We Come Over – Arrange a time for us to come over and perform an inspection of the vehicle so we can offer the most accurate price possible for your car. Get Paid Top Cash – We pay you on the spot, before using our vehicle removal equipment to take your car back to our salvage yard. Once there we wreck the car and salvage the parts. How much does it cost to remove the unregistered car? Our company don’t charge anything for the removal of your vehicle. We don’t hide the charge by offering you less than what your car should be worth. We perform the removal for free. This is so that you can the most money possible, and be a fully satisfied customer. How do we deal with unregistered car after buying it from you? In Western Australia, it is not very easy to get rid of unregistered vehicle. But we buy it from you without inquiring much and always pay you more cash than other sale methods. First of all, we assess the condition of the vehicle if it’s running or not, also the rest of the disorders. If we think that vehicle can be better as running after registering then redo the registration and sell a car as a pre-owned vehicles. On the other hand, if the vehicle is dead, scrap or junk condition then we dismantle it for parts and accessories. In both cases, we pay you cash, more or less. If the vehicle is neither in good condition nor good for parts then we press it for metal recycling and sell the metal to different recycling departments who make the dissimilar industry products with that.